We helped the Australian Diabetes Council create a clear, effective and valuable website for diabetes sufferers, and people at risk of developing the disease. As one of Australia's leading charities, it's vital that the Australian Diabetes Council has a strong online presence. When the Council changed names in 2010 (formerly Diabetes Australia-NSW), they needed a reliable partner to help with their rebranding and development. We were engaged to work alongside creative agency, Doppio. The Australian Diabetes Council wanted to provide users with clear, easy to read information. Our design focuses on displaying images and case studies from real diabetes sufferers - making it a comforting forum for those affected. 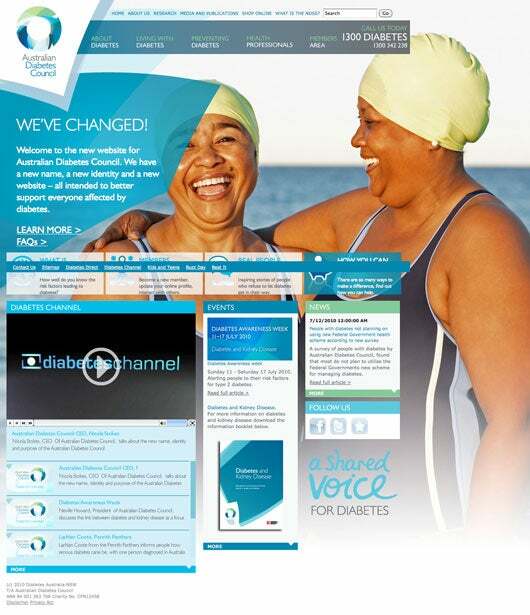 We also incorporated interactive elements - such as streaming video - to help promote greater public awareness of diabetes, and included social bookmarking functionality to help increase the relevance of the content. For the Council, it was also important that they were able to frequently update the site and manage the content independently. For this reason, we integrated a Kentico CMS. The website was launched in July 2010, to coincide with National Diabetes Awareness Week.